Take your tofu and cut it lengthwise into four 1-inch slices. Place the slices between double layers of paper towels, weighing the tofu down (we placed a cutting board over the tofu and then placed enough books on it to press the tofu down) for 10 minutes*. Once the tofu is pressed, cut the slices into 1-inch cubes. While the tofu is being pressed, take a small mixing bowl out and add the following ingredients to it, stirring to combine: water, hoisin sauce, soy sauce, ginger and crushed red pepper. Take a 12-inch skillet and pour one tablespoon of the oil in, setting the heat to medium-high. Once the oil’s hot, add the tofu into the skillet in a single layer and leave it to cook (no stirring) for 4 to 5 minutes or until it starts to brown (we cooked ours for 4 minutes). Flip the tofu and let it cook without moving for another 4 to 5 minutes or until the tofu looks browned on all sides (it took less than 4 minutes for the other side to get browned). Take the tofu out of the skillet and place it on a plate for the time being. Pour the remaining oil into the skillet, tossing the garlic into the skillet once the oil’s hot. Stir the garlic around constantly for 30 seconds, adding the green beans in afterwards. Stir the mixture occasionally** for 4 minutes or until the green beans are nearly tender (4 minutes did the job for us). Add the tofu back into the skillet, pouring the sauce in afterwards. 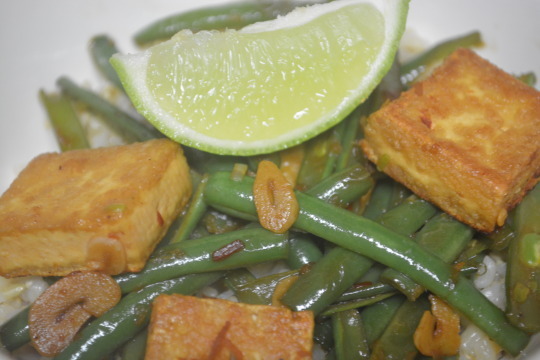 Bring the sauce to a boil, stirring so the tofu and green beans get coated in the sauce. Serve immediately with the rice and lime wedges. *We didn’t measure how long it took to get all the water pressed out of the tofu and we changed out the paper towels when they’d get too wet. **We didn’t want the garlic to burn so we stirred the green bean and garlic mixture constantly. We thought this dish tasted good straight from the skillet but it tasted even better once we squeezed some lime juice over it. We think the dish could be improved by doubling the sauce though. It’s just our preference, but we think the green beans would’ve been even better if they’d been halved across rather than lengthwise. Even though there’s a few little tweaks we’d make to this, this is something we’re definitely going to enjoy having again ! We got this recipe from Better Homes & Gardens. We weren’t paid in any form to promote Better Homes & Gardens.